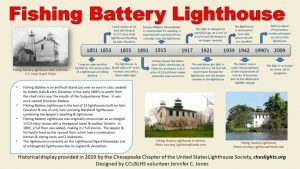 Historical Placard: Fishing Battery Lighthouse – Chesapeake Chapter U.S.L.H.S. The Fishing Battery Lighthouse indoor placard was presented on January 26, 2019. It is to be displayed in the Keeper’s House at Concord Point Lighthouse, Havre de Grace, Maryland. Jessica LaPota, Executive Director at Concord Point Lighthouse accepting the Fishing Battery Lighthouse timeline placard from chapter member Greg Krawczyk on January 26, 2019.